Unsere Wohnung ist alle nach außen, in der Nähe von Flughafen Teneriffa Süd und Medano Beach, verfügt über zwei Schlafzimmer, eines mit Doppelbett 1, 5 und das andere mit zwei Einzelbetten, hat eine voll ausgestattete Küche, ein Wohnzimmer mit u Schlafsofa, ein Bad, einen Balkon, eine Waschküche mit Waschmaschine und Sonnenterrasse. In der Wohnung kann 5 peopleand bequem ein Baby, und weniger als 5 km vom Flughafen Teneriffa Süd und weniger als 5 km Medano Beach. Die Wohnung verfügt über einen Festnetzanschluss, sowie kostenlose Gespräche zu mehr Internet ADSL bis 30 MB Festnetz auf. mit WLAN-Router. Es hat auch eine große Terrasse (Solarium) für die ausschließliche Verwendung von Mietern. Die Nachbarschaft von San Isidro ist ein wichtiges Geschäftsviertel im Süden Tinerfeño, gibt es viele kommerzielle Aktivitäten, Bars, Restaurants, Bekleidungsgeschäfte, Haushaltsgeräte, Supermärkte, Banken, Friseure, Apotheken, Hotels, primäre medizinische Dienste usw. Die Wohnung befindet sich in der Nähe der südlichen Autobahn, stoppt wichtigsten Bus in der Region und einem Taxistand. San Isidro ist eine ruhige, aber einfachen Zugang zu touristischen Gebiete im Süden der Insel Bezirk. The apartment was well equipped and had every thing we needed for an enjoyable stay. Communication with Abelardo was easy and fast and he was extremely helpful. The welcome pack was very generous. 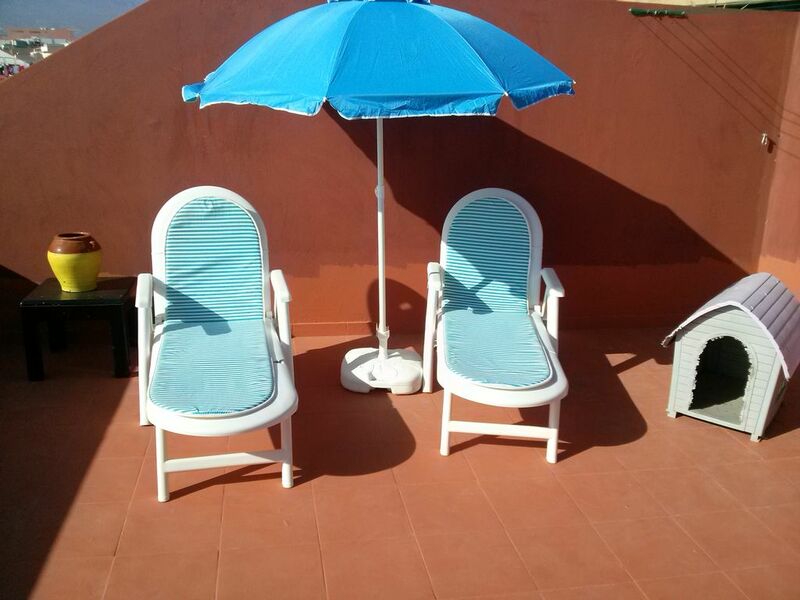 The roof terrace is very private with tables, chairs and loungers and gets sun all day. The apartment is about 3 minutes walk from the bus terminus and the bus service in all directions, including to and from the airport, was very good. Several supermarkets are within easy walking distance. We certainly hope to return. Het appartement van Abelardo voldoet zeker aan het nodige om een zorgeloos verblijf te hebben. We zijn heel tevreden. Vast ook wat mindere puntjes te vermelden (douche, oven, gehorigheid,...) maar doorééngenomen is dit zeker een 4-sterren waard. Abelardo is een attente gastheer en ook heel correct in communicatie. We hadden een geslaagde vakantie en hopen hier nog terug te komen. Perfecta para ir con tu mascota. Sólo puedo decir cosas buenas....la recomiendo 100%...A la casa no le falta detalle, muy bien situada cerca de playa y restaurantes de la zona..ideal para ir con tu mascota tiene una terraza muy grande y privativa donde poder ducharlas, en ella también podrás tomar el sol...lo dicho muy recomendable si viajas con tu mejor amigo canino..y su propietario es muy amable.gracias. We​ had two weeks staying in this lovely apartment.It was immaculately clean and very well equipped.The king size bed was extremely comfortable ensuring a good night's sleep.A bonus for us was that the apartment had a smart TV which received the mainstream UK TV channels, BBC, ITV, C4 + Others via a separate receiver.The balcony off of the living room received the afternoon sun until dusk which was great for having an early evening drink. The fantastic roof terrace which is accessed by an external staircase basked in sunshine ALL day long. Just a short walk away there is a Hippo Dino, Mercadonna and LIDL. Also the host Abelardo is very hospitable and will do everything he can to accommodate your needs including an unexpected but gratefully received well stocked fridge on our arrival.Thank you very much!!! If we were to return to San Isidro again we be more than happy to stay here again. Joanne & John, Pontefract, UK. El apartamento estaba exactamente como decia el anuncio. Estaba mas facil de encontrar que pensabamos, porque esta practicamente al lado de la autopista. El propietario esta muy agradable y nada complicado, porque el estaba muy flexible con la entrega de las llaves. Un detalle fue que nos dejo todo necesario y mas preparado (agua portable, prosecco, vino tinto/blanco, cerveza, refrescos, lavajilla, cosas para lavar la ropa, jabon, champu, monton de toallas, la cocina muy bien equipada....) para vivir y disfrutar la estancia al maximo. Las teles (con canales extranjeros tambien) y el WIFI funcionaban sin problema. Se agradece la confianza en el punto de salir del apartamento. Solo teniamos que mandar un mensaje y dejar las llaves dentro. Como nos quedabamos poco tiempo, no nos dejaba tiempo a disfrutar la terraza amplia en la azotea. En la zona del apartamento se encuentra todo (bancos, supermercado, talleres, bares, restaurantes...). La unica "queja" seria el plato de ducha, que hasta para una persona sola esta bastante chiquitito. Puedo recomendar este apartamento sin ninguna duda! Muchas gracias Abelardo por el gran servicio! Dejar el apartamento en buenas condiciones el dia de salida.